Dear Elizabeth and everyone at T stands for Tuesday So happy to hear that many of you are already enjoying the advent of Spring. Here it is 84 degrees and we are all burning from the heat and humidity. We are trying to drink as many glasses of water as we can to keep ourselves hydrated. 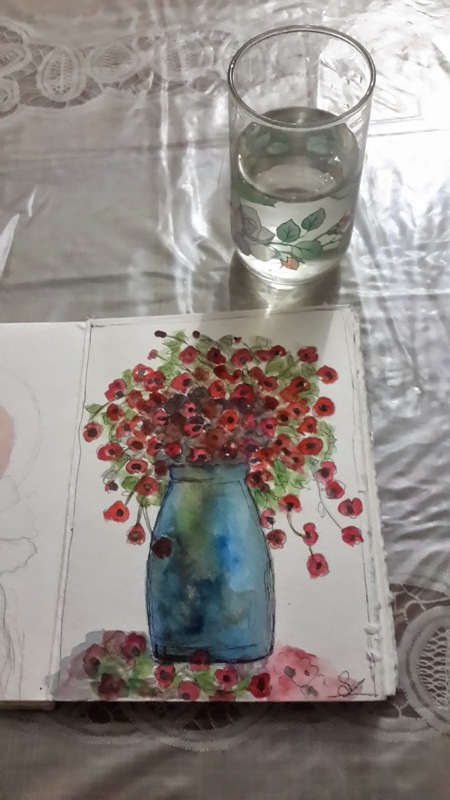 This is a vase of red flowers in watercolor to all my friends there who had been waiting for Spring. Of late, I had been facing some hard times. After some whining and thinking I concluded thus: " For every new path that you take, there are some valuable lessons learned..." but I was still seething inside and then a friend of mine unknowingly shared this powerful quote by Chanakya, an ancient Indian philosopher and teacher, " Don'T be disappointed when nobody stands with you.. Chanakya rightly said: "I am thankful to those who left me, because they taught me I CAN DO IT ALONE!" I felt so much better after thinking on these lines and again i felt the healing touch of having wonderful friends in my life. What a great turn around in thinking Susan. Wonderful words that are so packed with truth. I sometimes grow tired of "Doing it alone", but God lifts my spirits with a beautiful sun rise and/ or a beautiful sunset and I know that I am one day stronger. You knocked that painting right out of the park! It is fabulous!! Oh dear Susan thank you for that gorgeous bouquet of flowers!! Sorry you've been going through a challenging time . I love that the universe conspired to bring you the perfect quote when it is just what was needed. Here's to happier days! Happy T day to you too. I am so happy that you found soulful healing in those heart given words. It can be at the slightest touch that true friends are felt. What a great quote and just what you needed to change your attitude. 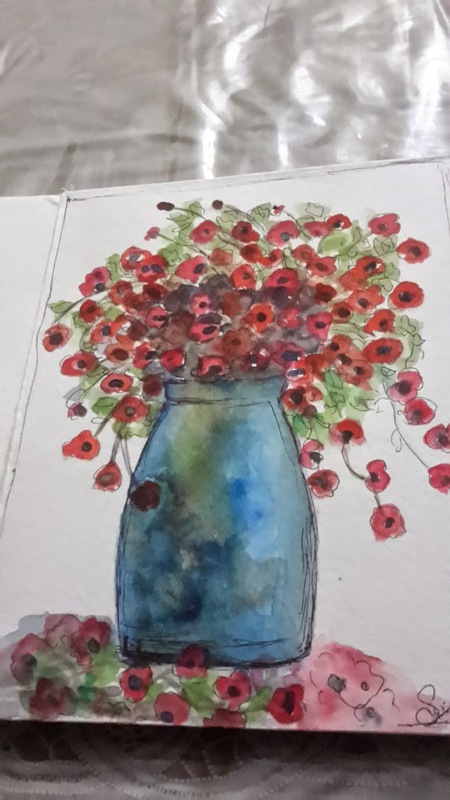 I am in LOVE with that watercolor you created. You draw see-through vases so well. And the flowers are gorgeous, too. It was quite warm here for a few days, so I can relate to your dilemma. Water hydrates and tastes quite good, too. I'm glad you shared it AND your beautiful vase of flowers with us for T this Tuesday. That certainly is a very powerful quote from your caring friend. People that disappoint us in life are great teachers too. I am not a fan of really hot and humid weather so I feel for you. I never complain in the winter here in Virginia, but summers can get very uncomfortable. Sending every good and special wish your way. Your painting is beautiful as is all of your artwork Susan. I love your red flowers and the quote is spot on. I hope things are improving for you. Hello and Happy T Day Susan! What a gorgeous drawing/painting this is, THANK YOU!! I'm sorry you are having a hard time and thankful someone could help you feel better. The words are beautiful and true in the quote too, haven't head that one before. Sending you much love and hugs and prayers my friend. So glad you made it this week and stopped by. I do love the picture of my mom and sisters, something about it just makes me happy. We have our next coupled monthly dates planned and I hope they go this well. I had a sick one home yesterday so making rounds a bit late, she is doing better today. We will be lazy and watch movies and rest and I'm packing for a scrap retreat this weekend. Just 20mts away, so excited but not sure what to work on. Wish me luck. again, much love and hugs dear friend. Gorgeous painting! The flowers appear to be 3D. Very cool. THANK YOU! for the lovely bouquet to remind us in the frozen north what Spring looks like and for that wonderful life lesson! I too have embarked on a new path this past year, and although I thought I was OK with it I found a pocket of resenment hiding in my heart... Sharing that quote has helped me along too! Thank you for sharing my T-Day!